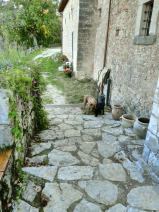 Successful Yoga retreat for sale completely renovated in 2014 in Umbria, Italy. This Yoga business is set up for new management to trade immediately. Indulge your passion while earning a great income. A spacious 5 bedroom, 6 bathroom villa completely renovated in 2014 and finished to a high spec, sleeps up to 12 in total. Each bedroom is En-Suite. 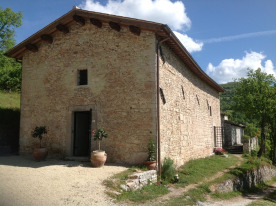 15th Century Church used as the venue for Yoga classes as part of an onsite Yoga retreat. 10 Acres of Private Land. Outdoor Swimming Pool (10m x 6m). Complete with all fixtures and fittings – linen, towels, white goods. You’ll be owning a part of history at San Flaviano, the on-site church is one of Italy's oldest buildings and comes complete with frescoes dating back to the 15th century. The main villa is arranged with the bedrooms accessible via a Portico with stunning views - all guests are greeted with a far reaching fabulous views of the Sibillini mountains to start their day! The accommodation includes a spacious living room with dining area and a wonderful open fireplace, a high spec kitchen perfect for catering for up to 12, and High Speed Internet Access. With stunning 360 degree mountain views, an outdoor terrace and without noise or light pollution, this is an opportunity for your guests to relax, recharge their batteries and will allow you to offer them a comfortable stay from day one. The church also has an oak beamed mezzanine added with 2 luxury bathrooms, open plan living and sleeping area for individuals or groups of 4. 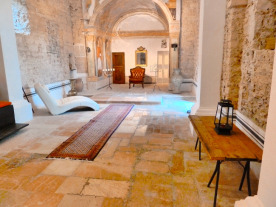 The oldest section of the church, dating back to 10th century is now a comfortable living room with Cast Iron Eco stove. 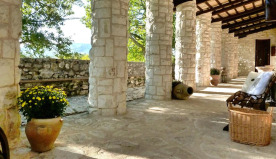 This yoga retreat for sale is conveniently located just 55 minutes from Perugia Airport, 30 minutes from a fabulous gourmet supermarket and one of Italy’s best restaurants, and 45 minutes from major shopping hub, Spoleto. There is also a deluxe spa just 25 minutes drive away, perfect for excursions or for a local partnership. The property is surrounded by 10 acres of ancient oak forest and mountain views. The perfect place to get away from it all and for guests to relax mind, body and soul. The Yoga retreat could continue on an All-Inclusive retreat basis (established and successful) run by the owners or could be rented out to outside organisers to run the management and operation leaving you time for preparing food and more free time. Cost-effective staff accommodation is available locally if the property is to be let at maximum capacity. The Yoga instructors that have been employed to date could be introduced to the new owners for consistency in teaching styles, and to date have offered: Ayurveda, Hatha, Vinyasa, Aerial and Ashtanga Yoga styles, in addition to more specialist depending on the guests’ preferences. Energy healing and psychotherapy retreats have also been offered and are very popular. The site lends itself to many varied pursuits. The season has historically run from April to October, with high season running in July and August – the location perched in the mountains means that in peak season the temperature is comparatively moderate to Florence and Rome. Perfect for families, friends, groups or individuals and with ample space for pets, at peak season the business has a high turnover and without competition for 100km you’ll be owning a unique Yoga destination in rural central Italy. The retreat has been run with a community feel, with the all-inclusive breaks including all meals served on the terrace with peaceful mountain views. 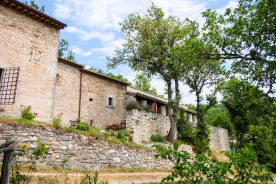 This yoga retreat for sale is one of Italy’s most popular and has run at over 90% room capacity since the business began trading in 2015. This property is offered in truly exceptional and move-in condition, you could begin trading from day one! As the reputation for the business has built since trading began, new management will be able to offer to the market competitive yet profitable rates. Also included in the sale is a fully functioning e commerce website with current top 10 listing on Google and support with SEO via a third party agency as well as an established listing on one of the market-leading Yoga Retreat booking sites. With a marketing set-up already, you will be able to hit the ground running. Current owners will walk the new buyers through each step to ensure a smooth transition. There is also an opportunity to extend the existing property and swimming pool in the future. The current owners purchased the property in 2014 and have completely renovated and enjoyed their time operating this popular and successful business. It is their desire to relocate to help children in Africa and want to see this outstanding business venture continue on. A truly unique business investment opportunity for those interested in Yoga and Spirituality.